Gray’s Landing provides affordable housing in the emerging South Waterfront neighborhood of Portland. Image courtesy of Jeff Amram. A new affordable housing development in Portland, Oregon is home to one of the city’s largest living rooftops. Gray’s Landing boasts a dynamic green roof complete with native plantings and a solar array. Developed by REACH Community Development, the Leadership in Energy and Environmental Design (LEED™) Platinum-certified project is a recent addition to the South Waterfront neighborhood. The 130-acre swath of vacated industrial land has been the focus of redevelopment efforts since its designation as an urban renewal area in 1999. Located along the western bank of the Willamette River, South Waterfront is one of five “ecodistricts” within the city limits — a designation that fosters sustainable development practices at the neighborhood scale. The green roof consists of 29,000 square feet of vegetation and 64 solar panels that will provide approximately 50 percent of the building’s hot water. The vegetation begins to take hold after being planted. Image courtesy of Julie Keefe. Like many other cities, Portland has a combined sewer system that overflows into urban waterways during heavy rainstorms. For this reason, water quality protection is a priority in the city. Efforts in South Waterfront have focused on greening the rooftops of new developments, which capture and retain stormwater, reducing the amount of water released to streams and rivers. South Waterfront is the first neighborhood in Portland to receive Salmon-Safe certification , which recognizes development practices that protect water resources. At Gray’s Landing, the 29,000-square-foot area of rooftop plantings (including sedums, succulents, and grasses) is designed to manage approximately 70 percent of the rainfall onsite, which is significant in rain-soaked Portland. An elevated courtyard treats the remaining stormwater through an engineered system of planters, porous pavers, and an underground cistern. Building operations and performance also benefit. Estimated to last twice as long as a traditional roof, the green roof provides protection from direct exposure to the elements and ultraviolet radiation. The layer of vegetation also insulates the building, reducing its cooling and heating demand. In addition, 64 solar panels on the green roof will provide approximately 50 percent of Gray’s Landing's domestic hot water heating. That investment will pay for itself in approximately eight years through defrayed energy costs, according to Riad Sahli, housing project manager for REACH. Perhaps more notable than the green roof at Gray’s Landing is what lies beneath it: the project will provide sustainable and affordable housing for the city’s low-income population. 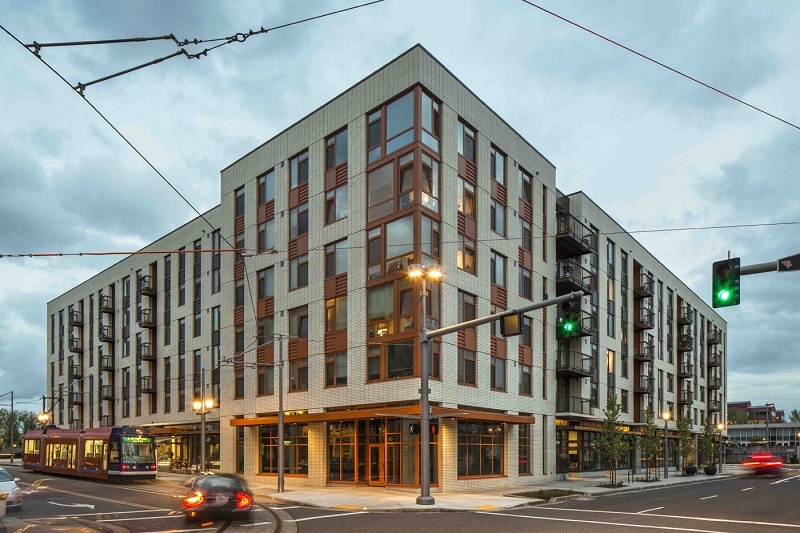 The six-story building is the first affordable housing completed in the redeveloping neighborhood and includes 56 studio apartments, 123 one-bedroom units, and 30 two-bedroom units, along with 12,000 square feet of office space (occupied by REACH) and 5,000 square feet of commercial space. The residential units are available to households earning up to 60 percent of area median income, with 42 of the units set aside for low-income, formerly homeless veterans. REACH coordinated with Home Forward (formerly the Housing Authority of Portland) and the U.S. Department of Veterans Affairs (VA) Regional Office in Portland to ensure that some of the area’s most vulnerable residents received housing, and VA staff provides direct case management services to residents onsite. The South Waterfront location provides residents with a variety of transportation options. An aerial tram connects the neighborhood with Oregon Health and Science University to the east, and the city’s streetcar line, which ends near the project site, provides access to many of the city’s neighborhoods. According to Sahli, an agreement between REACH and the streetcar operator, Tri-County Metropolitan Transportation District of Oregon (TriMet), provides residents with steeply discounted transit fares in exchange for a break room at Gray’s Landing for TriMet employees. Along with transit access, the project is well served by pedestrian and cycling paths, and Gray’s Landing provides secure bicycle parking for residents. Financing for the $50 million project came from a combination of local, state, and federal sources. The Portland Housing Bureau contributed a $23.5 million loan through the city’s tax increment financing program, $11.5 million in 4-percent tax credit equity, $8.5 million in permanent bond financing, and a $370,000 economic development initiative grant from HUD. 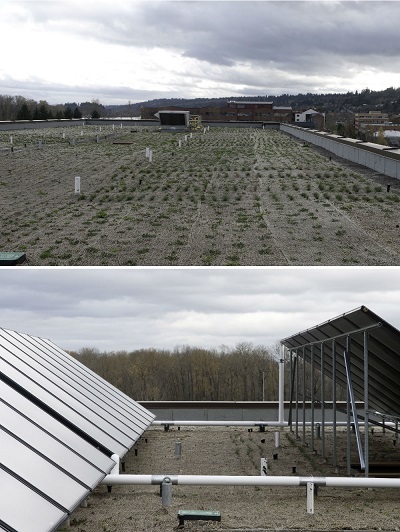 The additional costs associated with the green roof were partially financed through the Ecoroof Incentive program of Portland’s Bureau of Environmental Services. The program provided the project with $5 per square foot of vegetated roofing, a grant totaling $145,000. Gray’s Landing would not have been possible without close coordination among REACH, the Portland Housing Bureau, Home Forward, Oregon Housing and Community Services, and HUD. Gray’s Landing is part of a large redevelopment strategy for South Waterfront that promotes watershed protection and green building practices at the neighborhood scale. As the first affordable housing development completed in the South Waterfront, the project provides low-income households and formerly homeless veterans with housing opportunities while also promoting sustainable neighborhood development through the building’s dynamic green rooftop.